Imagine being able to cook authentic, stonebaked, Italian-style pizza in the warmth and comfort of your own garden. 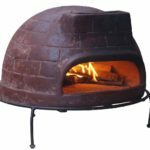 Ideal for a summer barbecue or evening garden party, this rustic stone wood-fired pizza oven is sure to be a hit with your friends and neighbours, delivering hot, crispy pizza within minutes. 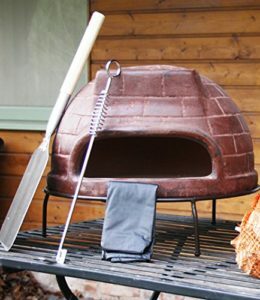 This simple stone pizza oven is available across the UK and comes with everything you will need to bake perfect pizzas, including a waterproof canvas cover, metal stand, metal rake, pizza peel and two bags of wood kindling. Measuring 63 x 63 x 50 cm, this wood-fired pizza oven is designed to cook one pizza at a time and will fit pizzas of up to 12”. And there is no need to limit yourself to just pizza – this cute little ceramic oven works equally well for mouthwatering melted camembert and garlic bread. The best thing about this Garden Outdoor Wood Fired Pizza Oven is that it’s incredibly easy to use. You start by burning smaller pieces of dry kindling in the back of the oven, and gradually add some larger pieces of wood on top. As the fire picks up, push the burning wood and embers right to the back, so there is plenty of space to cook the pizzas. Ideally, you want the flames to be coming up through the chimney. Once the heat is such that you can feel it radiating through the oven walls – approximately 20 minutes – then is the time to start cooking your pizza. 350ºC is the perfect temperature for fast and crispy stonebaked pizza. Be sure to keep adding wood at the back as you go, to ensure the oven stays nice and hot. With all of the heat radiating from the back of the oven, it’s a good idea to keep turning your pizza using the metal tongs as it cooks, to ensure an even bake. You’ll be amazed at how quickly the pizzas will cook and start to brown – 3-5 minutes in the oven is all that’s needed. This authentic ceramic pizza oven would make a fantastic centrepiece for a make-your-own-pizza party, allowing guests to add toppings and cook delicious pizzas quickly throughout the evening. A potential downside of this wood-fired pizza oven is its size. It will only fit pizzas that are up to 12” in diameter. Perfect for a small gathering – slightly inadequate for a bigger bash. It also eats up a fair amount of wood per use – it will easily get through an entire bag in one sitting. But for occasional small groups of family and friends, it’s a wonderful summer evening accompaniment and BBQ alternative. Crack open a bottle of red wine and enjoy artisan pizza as it was intended.